You wouldn't believe how much sushi research I did for this. I love doing research. Unfortunately, there's only 1 good sushi restaurant (Ichiro Sushi) in my town. Although they are awesome, I needed more visual sushi variety. I had to go with Plan B. Let me back up a bit. I was hired buy my client to create kawaii sushi for a variety of stationery products. Kawaii art is super cute art. It's rounded and soft and usually includes cute little faces. I drew a few varieties of cute sushi, but these won. The soft pastel color scheme adds to the cuteness. The magnets are my fave! SECOND, I look for reference and style. This is when I scour through Pinterest. I have gathered tons of ideas on my Pinterest boards. This time around I fell in love with an artist Tomoko Suzuki. I liked how she put the scene inside the rabbit. Cool, eh? THIRD, I sketch and erase and sketch and erase (paper and pencil like). When I'm happy, it's off to the computer. There the idea evolves into colors, composition and experimenting. LAST, THE REPEAT. Actually I've been thinking of this since the beginning. This one become a directional pattern. Hurray! My "Swan Lake" design made it to #8 this week. My ballerina princess is standing amidst her swan friends. This happy design is would be great for anything "Girl". It's available for purchase on Spoonflower as fabric, wallpaper and giftwrap. Burda Style has come out with a sporty new dress on Sprout Patterns. The Mint Dress pattern features side metal zipper pockets and a deep V neckline. Sprout allows you to select from a large variety of print patterns but I really like it in this print called Pacific Glow. Ok, so I designed Pacific Glow. I wanted to create a print with a tribal yet tropical feel. My design inspiration was Polynesian tapa cloth. Tapa cloth usually consists of geometric patterns or motifs set in a grid like arrangement. The result is a fabric that has a lively striped or checkerboard feel to it. You've probably seen a Hawaiian shirt with a tapa inspired pattern. I also discovered that true tapa cloth isn't actually cloth. It's made from the inner part of tree bark which is pounded flat. Pacific Glow comes in three colors: a dreamy navy, a vibrant orange, and an earthy brown. The design features palm trees, ocean waves and a mishmash of interconnected concentric circles. It looks great as a dress, but would also make an excellent bag, a pillow or bedding. See more of my Polynesian inspired fabric here. The Milton Art Center has a community art project known as Art in the Windows. It all begins in the late spring. Teachers are matched up with groups of kids, usually Boy Scouts or Girl Scouts. We create a piece of art that will be displayed in a prominent location outdoors. This year I was paired up with a great group of lively girls from Saint Agatha's Catholic School. The theme this year was ANIMALS. My group of 4th grade girls were all about fairies, make believe and magic. There was one girl who was obsessed with pigs, but as brainstorming began... things turned mythical. Soon there talk was all about about unicorns. However some of the girls really liked the idea of the ocean. We eventually settled on the narwhal. 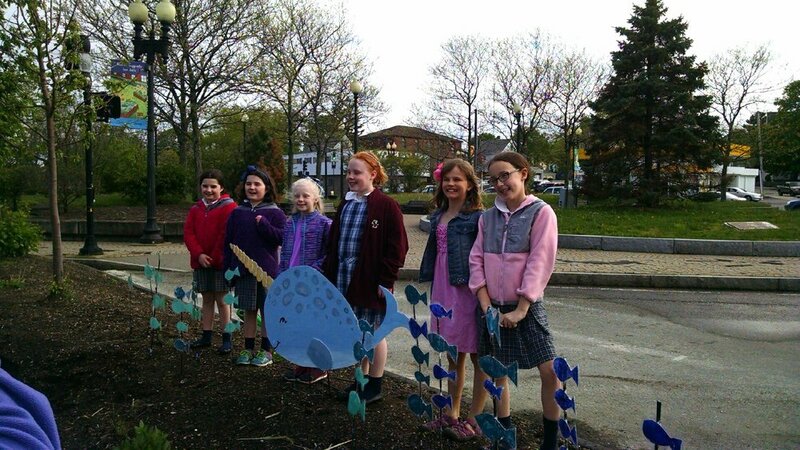 We decided we would have a magical narwhal swimming amongst a school of fish. We used found materials, milk jugs and a spare sheet of vinyl board that was hanging around doing nothing. It was all looking fine until we painted the milk jugs. You see, the milk jugs were cut out into fish. We decided to paint the fish from a light teal blue to a deep blue (to have a gradated effect). Well, I learned something very important about milk jugs! Paint on milk jugs is not waterproof. Even if you spay fixative on them. Even if you ModPodge them to death. 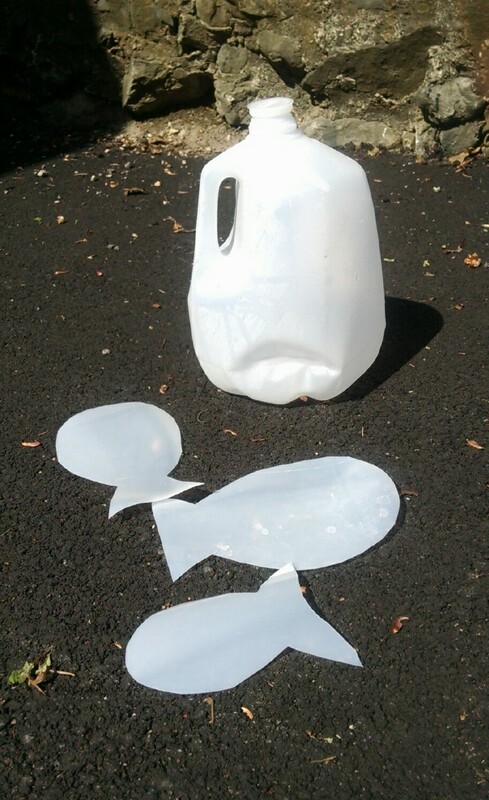 Sad to say, after a few good rainstorms are colorful school of fish turned milk jug white. On the bright side, the narwhal survived and looked awesome. Otomi Toucan pattern to be featured on BucketFeet shoes. BucketFeet and Spoonflower have come together yet again to help artists put their best foot forward, literally. This particular Spoonflower Challenge asked its design community to create animal inspired themes based on 4 specific habitats (desert, mountain, jungle and aquatic). This colorful design was my "jungle" submission. Let me just say, I didn't think this was a winner. (I didn't think it was leafy enough.) However, I'm so happy to have won. Thanks to EVERYONE who voted for me. Recently, my "Yellow Eyes" design was featured in a Spoonflower email. (It's on the bottom left.) 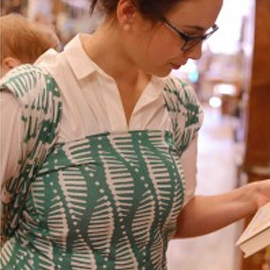 Spoonflower is a sight for independent surface designers to sell and showcase their patterns. This spring I joined up with the Milton Art Center's fourth annual Art in the Windows project. This year, 183 kids participated in this community art project. The kids were divided into 15 groups. Each group worked on an art installation that were then sprinkled throughout the town of Milton. Just so you know, Milton is a medium-sized town that borders with Boston, Massachusetts. My young group of artists were in the 1st grade Daisy Scout Troop 69267. Daisy Scouts are the younger version of Girl Scouts. Like the Girl Scouts, each Daisy Scout works on specific activities which is then commemorated by a special pin or badge. These get added to her uniform. This project coordinated to one of their community-related badges. Art in the Windows has always revolve around a theme. This year the theme was "Up in the Air". Milton residents have been very concerned about the noise and air pollution caused by the airline flight paths running over the town. The art instructors worked with their group and brainstormed how they would represent "Up in the Air". Well, if you didn't know 1st graders, they can be extremely literal or way out there. After some discussion we decided on the sun and flowers. I came up with a few ideas. We all agreed that we would use as many recycled materials as possible. So, we decided to construct a sun/flower out of hoops and plastic bags. We bought some hoops and collected A LOT of plastic shopping bags. (The girls collected over 200 bags!) We trimmed the bottoms and the handles of each bag. We did this so that the bags would be foofy when we knotted them to the hoops. We also divided our bags into different colors. FYI, A large majority of our bags were white and red bags from Target. I sketched our project and shared it with the troop, the troop leaders and the Milton Art Center (MAC). The girls liked that we left the inner most circle open, especially when I said they could take pictures inside of it. I made sure to mention math to the girls and how I used geometric formulas to estimate how many bags we needed. I know it was too advanced for 1st graders, but I just wanted to show that math and art are connected. Here's the sketch I shared with my Daisy troop. Too complex for the 1st grade crowd, but I needed to also share it with grown-ups. I explained it in simpler terms to the Daisies. I caught one of them counting the loops (representing bags) around the hoops to see if I drew 200. We met a couple more times. I showed the girls how to tie a lark's head knot. It's a very simple knot and eventually almost all of them figured out how to tie one. The girls got to knotting and I think they had some zen moments. Repetitive stuff can sometimes do that to you. Once we finished, the MAC, the troop leaders and myself figured out where it would go. I then figured out how to hang it between 2 long garden stakes. When completed, many commuters enjoyed ours and other "Art in the Windows" installations while driving through town. All of us after installation. I love experimenting with repeat patterns. I enter Spoonflower contests when I have time or a great idea. Well, the Weekly Design Challenge for November 12, 20015 was themed "fitness". Although I'm not a fitness guru, I do yoga three times a week and try to go on a small run twice a week. That doesn't always happen, but its a weekly goal. Yoga has to be one of the best things ever created by human kind. It makes you feel awesome afterwards. I also like running, especially outside. I like experiencing nature's transformation from season to season. There are also a lot of little creatures scurrying away when someone is about to cross their path. So cute and fuzzy (unless its a skunk). This design merges yoga and nature. It's the tranquility you feel after a work out. I love this fabric in green and white! Cari Slings is a small family business located in North Carolina. 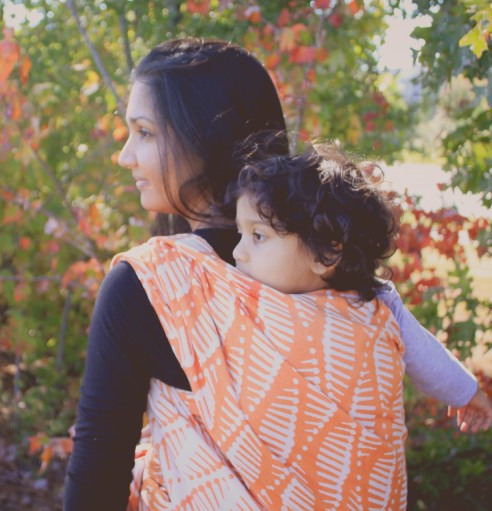 They create and manufacture high quality, boutique style machine woven wraps for carrying around little bundles of joy. They are currently selling a favorite pattern design of mine. It's a double helix sort of pattern and it's available in a few colors. Check out some more carriers here.